We (Mohua and I) left for Lucknow and Agra, since tomorrow (Friday) is holiday (Id) and 15th August is just round the corner. We left by the worst possible train Doon Express (8 pm). There are more than 50 stations to reach Lucknow! We reached Lucknow, 3 hours late. Before reaching Lucknow we got to know from the train, over phone, our online booking of hotel is invalid. So we have to book our hotel on reaching Lucknow! It was already 9.30 pm when we reached Lucknow. Luckily we got a hotel very near to the station. We went to the famous Tundey Kebab Restaurant at Aminabad for Galawati Kebab. It was closed due to Id! In fact almost all the shops are closed. We came back by rickshaw (Rs 20 each way) to our hotel near railway station. There is Lucknow Homestay on Mall Avenue, South Lucknow, proficiently run by Ms Naheed Varma for many years (0522-6460592). It is possibly the best place to stay in Lucknow. But is quite far from the Railway station.It has a very good rating by Trip advisor and my friend had also recommended it. Lucknow, the capital of Uttar Pradesh, thrives along the banks of Gomati River. Awadh is a region in the centre of Uttar Pradesh, which was before independence known as the United Provinces of Agra and Oudh. The word Oudh or Oude is derived from Ayodhya, and was established around 1722 AD with Faizabad as its capital and Sadat Ali Khan as its first Nawab and progenitor of Nawabs of Awadh. 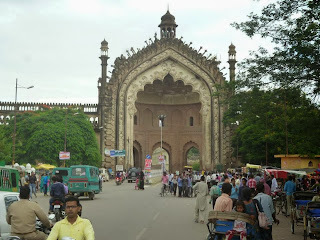 The traditional capital of Awadh has been Faizabad and later Lucknow the capital of the modern day Uttar Pradesh. Today, Lucknow is dotted with remnants of its rich cultural past. Lucknow is also known for its elaborate cuisine and Chikan or exquisite shadow-work embroidery on fine muslin cloth and dance forms such as Kathak. Awadhi and mughlai food is the delight of the visitors to Lucknow. Lucknow is a historically important city and for many centuries was at the heart of North Indian culture. In particular, the city was famous for its Adab and Tehzeeb (manners and hospitality) and beautiful gardens. It was also one of the sites of the 1857 Indian Mutiny (or First War of Indian Independence). The Hindi spoken in Lucknow is considered the most beautiful and gentle in the country. Currently the city has a population of around 25 lakh. 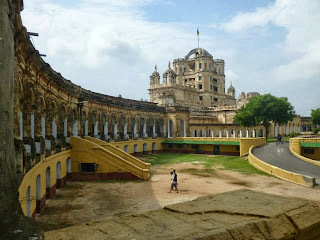 Lucknow is the heart of the art, cuisine, dance, culture and music of Northern India. It was the cradle of the Hindu- Muslim-Sikh symbioses. It accepted Western institutions like La Martiniere in her womb. 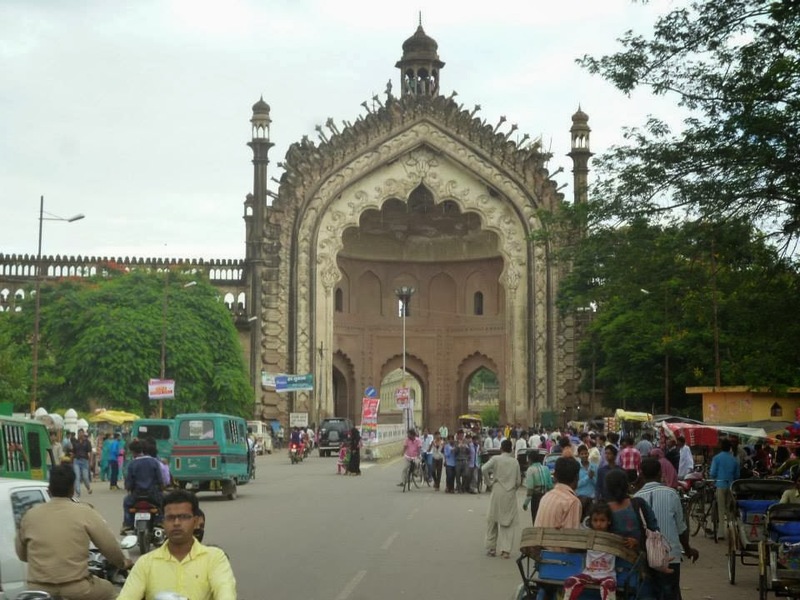 Lucknow is the home of Urdu and Hindi languages. The city became known as a centre for Urdu poetry and birth place and city of residence for many poets. The Mushaira, an event of poetry recitation forms the heart of Lucknow's nightlife where Mushairas go on into the wee hours of the night. Buses from Sunauli-Bhairawa on the India/Nepal border stop on their way to Varanasi. Lucknow has excellent connectivity of AC Deluxe bus service to cities like Delhi, Jaipur, Allahabad, Varanasi, and Agra. Lucknow is 363 km from Agra. Taxi and cycle rickshaw drivers in Lucknow are of the more insistent type. City Buses are available on all major routes. These are cheap safe and reliable mode of transport. Two types of 3 wheeler shared service is also available on most of city routs commonly known as “Tempo” and “Auto ". Tempo" runs on fixed specified routes. “Auto" can be hired as a taxi to your destination. We hired a cycle rickshaw for Rs 100, which is cheap and one can have 180 degree view. We started with Residency. It is not very far from our hotel. It is around 25 minutes from our hotel. Ruins of the Lucknow Residency and Museum. This was the scene of the 1857 First Battle for Independence, referred to by the British as `The Indian Mutiny.´ Although you can still clearly see numerous canon ball marks in the ruined buildings, thankfully it is a peaceful place today. We saw a number of couples in the leafy shady groves. The Residency is clearly recognized by the locals and tourists alike as a breezy haven to escape from the bustle and dust of a busy Indian city. The Residency served as the home of the British Resident, who was the representative in the court of the Nawab. In 1857, during the Indian uprising, it became the site of a bloody battle. Roughly 2,000 graves of those who died defending the British Empire are scattered throughout the dilapidated, canon-ball-shattered buildings. Not far from the Residency is Qaiserbagh Palace built between 1848-1850 by Lucknow’s last Nawab, Wajid Ali Shah. Much of it was damaged by the British after the uprising of 1857, but weddings and Mushairas are often held in the remaining halls. About six kilometres to the southeast of The Residency is La Martiniere College. 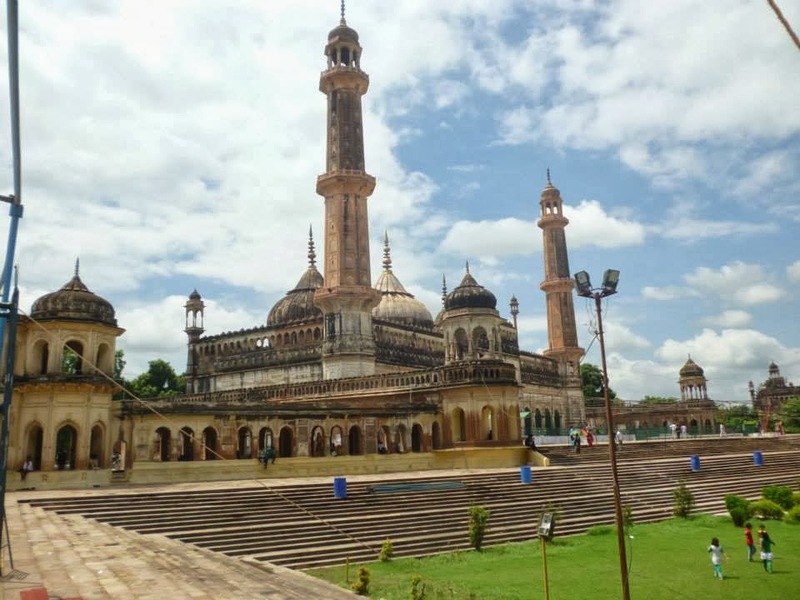 Bara Imambara and Bhool Bhulaiya: A large and impressive tomb complex built in 1783. You could easily spend half a day wandering around these beautiful but crumbling examples of Mughal architecture. The ticket you buy lets you enter here, the Chhota Imambara, the Hussainabad clock tower and picture gallery too, so do not lose your ticket. Please note that lone couples are not allowed to enter without a guide. You will also have to pay a man 1 rupee to mind your shoes while exploring the complex (shoes are not allowed inside Bara Imambara). Even the most cynical traveller will be impressed by Lucknow’s Imambara. The stunning, vast main hall of the Bara Imambara doesn’t get as much attention as the Bhool-Bhulaiya located above it, which leads visitors through a complex network of tunnels and stairways. 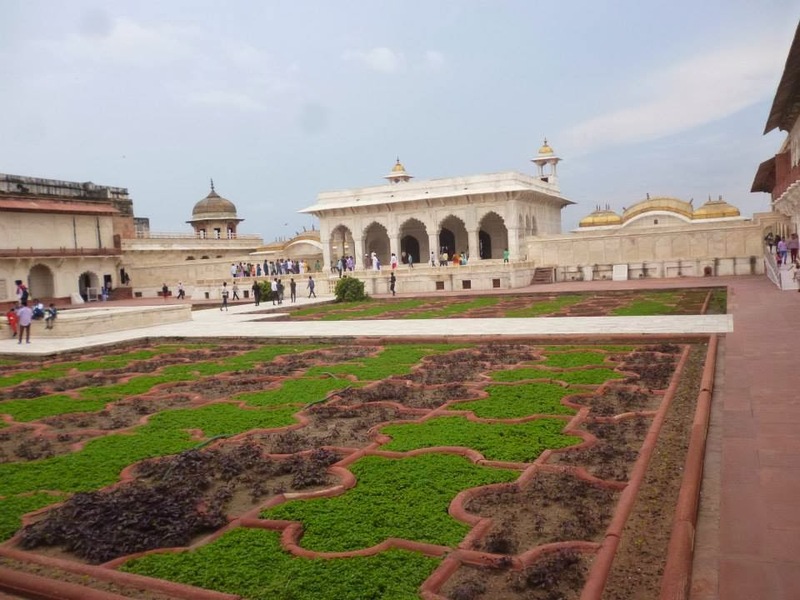 The maze is said to have been created by accident in order to support the weight of the heavy roof of this building, which was built by the reigning Nawab atop a marsh in 1784. But some legends claim that it was deliberately created to confuse intruders and trap them with dead-ends. Legend has it that a blocked tunnel inside was built to lead directly to the Gomati River. The structure boasts nearly 500 identical doorways, which can make you feel like you’ve stepped into a scene from an Indiana Jones film. It’s best to take a guide to help you navigate. I wanted to be lost without a guide but Mohua insisted for a guide and listen to the gibberish of the local guides (though we had 3 books in our hand.). On the roof of the Bara Imambara, the horizon opens up, revealing the pointed minarets of the Asafi Mosque, on the grounds. Rumi Darwaza: Just 150 metres from the Imambara is the staggering Rumi Darwaza (no admission fee). Like the Bara Imambara, the free standing gateway was built in 1784 by Nawab Asaf Ud-Daulah. The 60-foot structure has become the de facto symbol of Lucknow. Haunting and gorgeous, it is a great example of 18th-century Awadhi architecture. Hussainabad Clock Tower (Ghanta Ghar), not far to the east is the Hussainabad Clock Tower a Victorian structure built a century later. A British landmark set in a park with the somewhat poorly curated Bardari picture gallery, and a lake. It is apparently the tallest clock tower in India. The Chota Imambara is 5 minutes from Bara Imambara by cycle rickshaw. Though it lacks the mystical aura of its larger brother but makes up for it in beauty. The “Palace of Lights”, which is often decorated to correspond to specific holidays, was meant to be the mausoleum of the third Nawab of Awadh upon its construction in 1838. A fountain leads to the building with its golden dome and interior decked out with chandeliers. 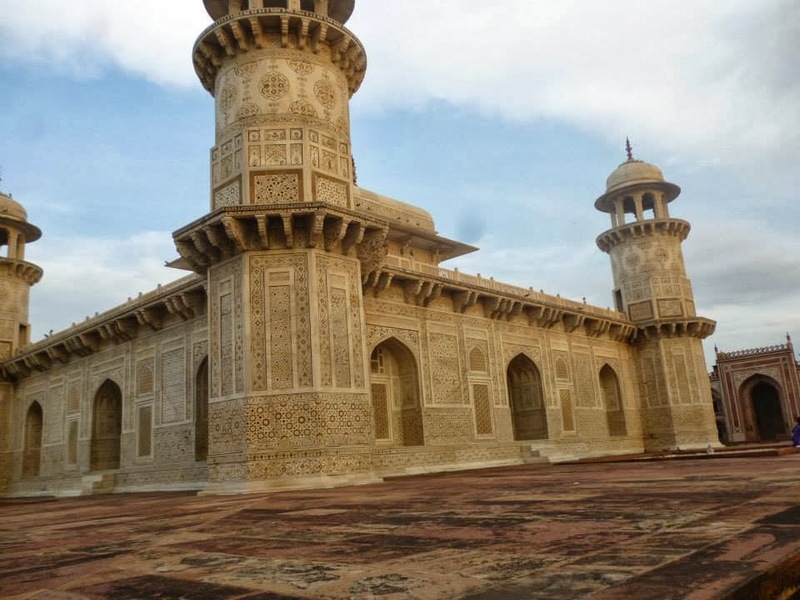 Within the same complex are two mausoleums that are replicas of the Taj Mahal. Both Imambara were built as food-for-work projects during times of famine. The Nawabs paid labourers with cooked meals. Who says Keynes has no predecessor!! When our rickshaw wala dropped us at Hazratganj it was already dark. We paid Rs 50 extra to him. He was really nice. We went to have the famous Basket chat from Royal Café. Hazratganj is equivalent to Connaught place or Esplanade of Kolkata. The basket chat is very similar to Gupta Brother’s Dahi Kachori. I felt happy the fact that I keep Gupta Brother’s Dahi Kachori in very high esteem is not without reason. Royal Café also serves regional variations of panipuri made with filtered water! We walked around the place for some time. It is quite a nice area. We were told that it was Mayawati who made this place so nice. It became apparent to us that people are not happy with Mulayam Singh Yadav and they felt Mayawati was much better. Today, again, I went to Aminabad for famous Tunday Kebab. Alas, even today it was closed because most of the workers have gone back to their village after fasting for a long time during the month of Ramadan. But I bought Biryani (half plate Rs 50) from Wahid, which is also in Aminabad. A picture of Dilip Kumar is hanging from the wall! We also bought some Kalija curry – because nothing else was available. I must say Biryani from Kolkata is definitely better. Then we left for our hotel (with the food to be had in our room) by rickshaw. We checked out in the morning from our hotel and kept the luggage at the hotel. Today we left for Shah Najaf Imambara by a local bus. Shah Najaf Imambara is a beautiful white domed structure situated at the bank of river Gomati and just about a one and half Kilometre away from main Hazratganj market. The road leading to Imambara is also called Shah Najaf Road. Constructed by Nawab Ghazi-ud-Din Haider in the year 1816- 17 to serve as his mausoleum. The unique thing is that it resembles with the Imam Hazrat Ali Rausa at Nazaaf city in Iraq. In this mausoleum the remains of Nawab Ghazi-ud-din Haider, his wives Sarfaraz Mahal, Mumtaz Mahal and also his European wife 'Mubarak Mahal' are buried. Ghazi-id-Din Haider (1769-1827) was fifth Nawab of Awadh. Almost opposite to it is Sahara Ganj Shopping Mall. We decided to have our brunch at Kebab express near to the Mall. There I had a Non Veg Thali – where I had Galawati Kebab. It means minced mutton (rather paste) Kebab – which is really very good. Later I got to know it is owned by same person who owns famous Cassia. The Biryani was also good. Better than what I had yesterday. Then we took a bus to Hazratganj and then by cycle rickshaw to La Martiniere College. It is also known as Constantia, La Martiniere College is one of the oldest schools in the country. It was built in 1840 and started as a school in 1845. The school building is still well maintained. This landmark building has also featured in several Bollywood movies. This gorgeous building is a rare cross-pollination between Italian and Mughal architecture. The visitors are not allowed inside the complex. I found the architecture quite stunning. Then we took a rickshaw to see the place where baba’s friend Mukul Ghosal used to stay. It is very near to the La Martiniere College. It is also the place where all the politicians stay. Now with plenty of time in our hand we decided to go to Lucknow Zoo. There is a Museum inside the Zoo. Unfortunately it was closed! The Zoo is not very big but better maintained than Kolkata’s Alipore Zoo. We bought something for Sumitra Boudi. We took the pictures and sent it through Whatsapp for her approval! Mohua did her puja shopping here! For high quality Chikan one can head to the SEWA store, which is a great example of how a dying art form has been revived and women artisans empowered. We went to have our dinner at the street next to Tulsi theatre in Hazratganj. There are numerous restaurants on a small alley. Unfortunately the famous Dastharkwan, was also closed due to Id. Luckily Naushijan was open. I had Galawati and Kakori (minced Lamb) and also Biryani. Biryani is good. But Galawati at Kebab express was better. We were told they have opened a restaurant in Kolkata at Mirza Ghalib Street in Kolkata. We rushed to our hotel to take our luggage and leave for station. Our train is at 11.35 pm. We reached Agra in time at around 5.30 am. Agra is some 200 km from Delhi. Agra has three UNESCO World Heritage sites, the Taj Mahal, Agra Fort and Fatehpur Sikri nearby. There are also many other buildings and tombs and no trip to India is complete without at least one visit to the Taj. Agra is on the main train line between the Delhi-Mumbai (Bombay) and Delhi-Chennai routes. Some east-bound trains from Delhi also travel via Agra to Eastern India (including Kolkata). Stations : There are many railway stations: Agra Cantt ( is the main railway station and lies southwest of the Taj and Agra Fort The station has a pretty good Comesum food court that also sells hygienic takeaway snacks (sandwiches, samosas, etc.) . Then there are Agra Fort station, Raja Ki Mandi (our train stopped at this station for some time), Agra City, Idgah Railway. We took an auto-rickshaw for Rs 50 to reach our hotel. Since it is part of cantonment area, the roads are very good for 80% of the route. From our hotel, West Gate is only 4 minutes. There is a nice view of Taj from the roof top of our hotel.The hotel rates in Agra is quite cheap because of huge competition. We paid Rs 600 for a AC room. While Agra's heyday was as the capital of the Mughal Empire between 1526 and 1658, the city was founded much earlier. 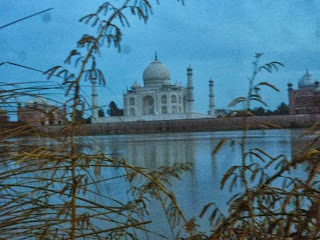 The earliest reference to Agra is in the ancient epic, the Mahabharata, while Ptolemy (was a Macedonian general under Alexander the Great, who became ruler of Egypt (323–283 BC) - not to be confused with the astronomer ) was the first person to call it by its modern name. 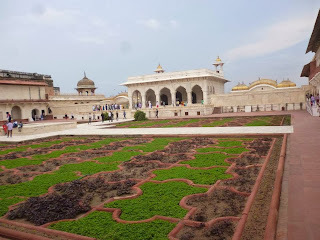 The recorded history of Agra begins around the 11th century and over the next 500 years, the city changed hands between various kings, both Hindu and Muslim. In 1506, Sultan Sikandar Lodi, the ruler of the Delhi Sultanate, moved his capital from Delhi to Agra. His son Ibrahim Lodi was the last ruler of the Lodi dynasty, as he was defeated in 1526 by Babur, the first Mughal ruler, in the famous battle of Panipat. Agra fell too, and became the capital of the Mughals, whose rule over Agra was uninterrupted except for a brief period between 1540 and 1556. The use of Canon (learnt from Turkey) was instrumental in their victory. Babur was a direct descendant of Timur, from the Barlas clan, through his father, and a descendant also of Genghis Khan through his mother. He was born in Fergana Valley in contemporary Uzbekistan and was buried in Kabul, Afghanistan at Bagh-e Babur (Babur Gardens). He is considered a national hero in Uzbekistan. Although Babur hailed from the Barlas tribe which was of Mongol origin, his tribe had embraced Turkic and Persian culture and converted to Islam and resided in Turkistan (not to be confused with Turkey - is a city in South Kazakhstan Region) and Khorasan (province in north eastern Iran). His mother tongue was the Chaghatai or Turkic language ( It was also spoken by the early Mughal rulers in the Indian subcontinent. Chagatai was later officially renamed "Old Uzbek" . The language is sometime known as Middle Turkic or even simply Turki. It served as a lingua franca in Central Asia, with a strong infusion of Arabic and Persian words.The Turkic languages are a language family of at least thirty-five languages, spoken by Turkic peoples from Southeastern Europe and the Mediterranean to Siberia.The Turkic language with the greatest number of speakers isTurkish, spoken mainly in Anatolia) and he was equally at home in Persian, the lingua franca of the Timurid elite. Uzbekistan is geographically not far from Iran. Babur wrote his memoirs and these form the main source for details of his life. They are known as the Baburnama and were written in Chaghatai Turkic, his mother-tongue, though his prose was highly Persianized in its sentence structure and vocabulary. Babur also had a great passion to kill people, cut heads off people and create pillars out of the cut off heads. He claimed to have created several such pillars in his autobiography. He was addicted to chewing narcotic preparations. Hence Babur, though nominally a Mongol (or Moghul in Persian language), drew much of his support from the local Turkic and Iranian people of Central Asia, and his army was diverse in its ethnic makeup. It included Persians , ethnic Afghans, Arabs, as well as Barlas and Chaghatayid Turco-Mongols from Central Asia. So Mughals came to power only 28 years after Vaso Da Gama landed in Calicut in 1498. Reign interrupted by Suri Dynasty. Deposed Humayun and led the Suri Dynasty. 2nd and last ruler of the Suri Dynasty - were eliminated by Humayun. Restored rule was more unified and effective than initial reign of 1530–1540; left unified empire for his son, Akbar. Opened first relations with the British East India Company. Reportedly was an alcoholic, and his wife Empress Noor Jahan became the real power behind the throne. In 1540, Sher Shah Suri overthrew Humayun became the ruler of much of North India, including Agra. After Sher Shah Suri's death his descendants proved unequal to the task of ruling the kingdom, and Hemu, a Hindu general of Suri became the effective ruler. In November 5, 1556, Hemu was defeated and killed in the second battle of Panipat by Akbar with the help of Bairam Khan, and the Mughals regained Agra. Humayun had been driven into exile in 1940 in Iran/Persia by the Afghan/Pashtun leader Sher Shah Suri. Humayun's return from the Persian court, reclaiming his throne 15 years later in 1955, was accompanied by the import of Persian nobles and artists -- which served as a cultural watershed from the Mughals' Central Asian origins to markedly Persian tastes -- in art, language and architecture. In Chehel Sotoun at Isfahan, Iran , a giant mural shows the reception of Humayun in the court of the then Safavid king in 1550 AD. There is also a mural of Nadir Shah there.For this you have to go to Iran ! History in isolation means nothing. Akbar did not go to Iran/Persia with his parents, but was brought up in Kabul by the extended family of uncles and his aunts. He spent his youth learning to hunt, run, and fight, made him a daring, powerful and a brave warrior, but he never learnt to read or write. Mughals were great builders. Babur built the Aram Bagh (garden of relaxation) modeled after the garden of paradise, where he was eventually buried after his death. His grandson Akbar refurbished the Agra fort and built the Fatehpur Sikri, an entire city just on the outskirts of Agra. He also renamed Agra after himself, and the city was known as Akbarabad while it was in Mughal hands. Akbar's grandson Shah Jahan would give Agra its most famous monument, the Taj Mahal, which is the mausoleum of his beloved wife, Mumtaz Mahal. 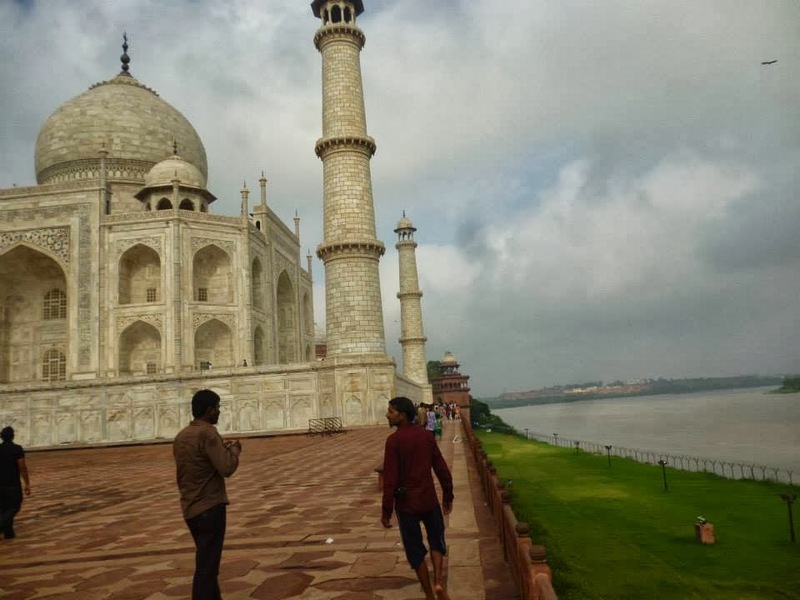 The Taj is constructed in white marble. It took 12 (and not 20) years as per National Geographic to construct, and is now universally known as a monument to love. Legend has it that Shah Jahan wanted a replica of the Taj constructed in black marble that would be his final resting place. There is no actual support for this theory. The traces of Black marble are there in Mehtab Bagh opposite of Taj. His plans were foiled by his son, who murdered 3 elder brothers and overthrew his father to acquire the throne. Shah Jahan is now buried alongside his wife in the Taj Mahal. His son Aurangzeb believed in austerity and was pious and had no time or inclination for the ostentation of his forefathers, preferring to spend his money on wars in South India. In any case, even during Shah Johan’s reign, which was the period when the Mughal Empire was at its height, the construction of the Taj put a strain on the resources of the empire and caused a min-famine around Agra. Shah Jahan was eventually buried in the Taj Mahal, next to his beloved Begum. Shah Jahan, in addition to giving Agra its greatest claim to fame, was also responsible for beginning its decline, as decided to shift his capital to Shahjahanabad, which we now know as Old Delhi, in 1658. Though Aurangzeb ordered a move back, this too was short lived, as he moved his headquarters down south to Aurangabad to be focus on his wars. Agra declined, and so did the Mughal Empire. The city was eventually captured by the Marathas, who renamed it back to Agra. In 1803, it came under the British and the city was incorporated into the state of Uttar Pradesh. Tongas (not so common these days), Auto-rickshaws and cycle-rickshaws are available everywhere, the best way to experience the city is to take a walk on the Mall Road (Sadar). The street is full of handicraft and leather goods shops. We decided to go to Fatehpur Sikri first. 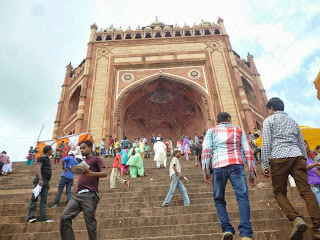 We took our breakfast and left for Bijli ghar (which is like Esplanade of Agra) by atuo (10 minutes – Rs 10) and from Bijli Ghar we took a bus to go to Fahtepur Sikri. The distance is 38 Km. It took more than an hour to reach there. Fatehpur Sikri is a UNESCO world heritage site. Built in the 16th century by the Emperor Akbar, Fatehpur Sikri (the City of Victory) was the capital of the Mughal Empire for about 10 years. It is around 40 Km from Agra. Then it was abandoned possibly because of water shortage (similar to Golconda of Deccan). It includes one of the largest mosques in India, the Jama Masjid. The Buland Darwaza of the Sikri is apparently the tallest gate. It is full of well-preserved palaces and courtyards, and is a must see for anyone visiting Agra. On Mohua’s insistence we took a guide. It is famous for Jodhabai. 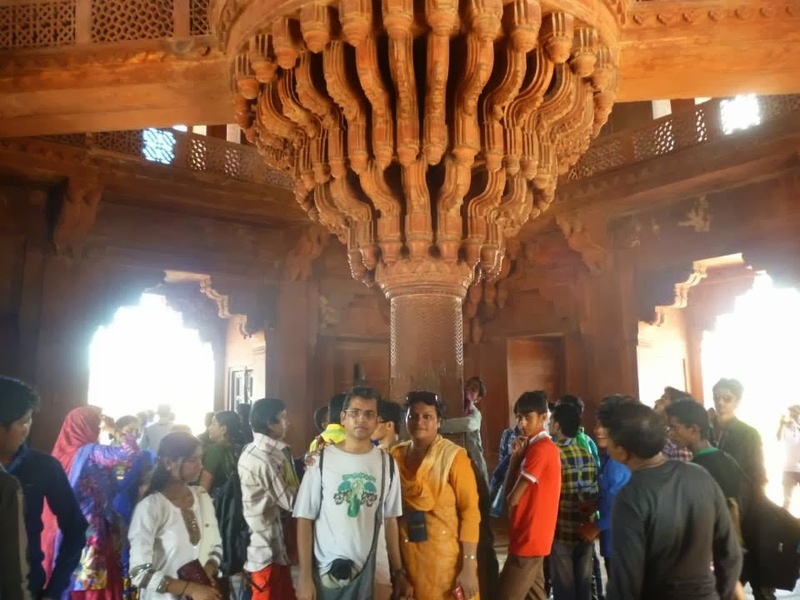 We saw a separate house of Jodhabai inside Fahtepur Sikri, where she used to worship. We also saw the chamber of Goan Christian wife of Akbar. 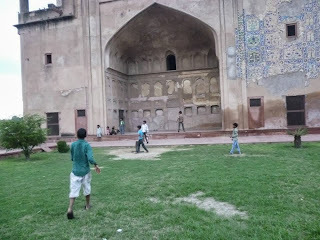 We also saw the air-conditioned chamber of Akbar! Jahangir’s mother Mariam Zammani is Akbar’s Christian wife. We also saw the mazhar of Selim Chisti, spiritual guru of Akbar. He was the person who predicted the birth of Sailm aka Jahangir. All his previous children were dying for various reasons. Then we had some lunch at a nearby restaurant. I bought Khatai biscuit, which is specialty of Sikri – which we eat in Kolkata also. Then we waited for some time to take the bus to go back to Agra. There was a big queue for last bus and there was a huge argument while riding the bus. When we reached Agra it is already late. We took early dinner since we planned to go to Taj early morning at 6 am. We got up early in the morning before 6 and left for the ticket counters in the West Gate. The Taj is open from 6:00 AM to 6:30 PM (sunset) every day except Friday. Entry costs are Rs 750 for foreigners and Rs 20 for Indians. The gates won't open until at 6AM at the earliest. You can also get very good views from Mehtab Bagh on the opposite side. There are 3 gates. To buy tickets, you can go to the South gate, but this gate is 1 km far away of the entrance and the counter opens at 8:00 AM. At the West and East gates, the counters open at 6:00 AM. These gates also have smaller queues in peak times as the big tour buses drop groups off at the South gate. The Taj is located pretty much in the middle of town. A large number of people turn up on weekends and public holidays. Alongside the ticket counter, you can also purchase a self-guided audio tour for Rs 100 in English. & Foreign Languages (currently French, Spanish, Italian, German). Reviews for the audio guides have been very positive on Trip advisor. Recently, a plethora of smartphone apps have become available that help visitors tour the monuments at their own pace. The Archaeological Survey of India offers perhaps the most detailed and extensive one called Official Taj Mahal offered for iOS and Android. A similar app called Official Agra Fort is also offered for the Agra Fort. There are night viewing sessions on the nights of a full moon and the two days before and tickets must be purchased 24 hours in advance, starting at 10 am. Make sure to wear mosquito repellent. It is a good idea to bring a flashlight, because the interior of the Taj Mahal is quite dark (even during the day) and to fully appreciate the details of the gem inlays, you need a good light. Ticket fare is Rs. 500 for Indian Nationals and Rs. 750 for Non-Indians. The viewing hours for night viewing are from 8:30 pm to 9:00 pm and 9:00 pm to 9:30 pm. On Mohua’s insistence we took a guide for Rs 200. The Taj Mahal is an immense mausoleum of white marble, built between 1631 and 1643 by order of the Mughal emperor Shah Jahan in memory of his favourite wife. Taj Mahal means Crown Palace; one of the wife's names was Mumtaz Mahal, Ornament of the Palace. The Taj is one of the most well preserved and architecturally beautiful tombs in the world, one of the masterpieces of Indian Muslim architecture, and one of the great sites of the world's heritage. The grounds of the complex include several other beautiful buildings, reflecting pools, and extensive ornamental gardens with flowering trees and bushes. The Taj framed by trees and reflected in a pool is amazing. Close up, large parts of the building are covered with inlaid stonework. In the harem of the Mughals all the members used to get money according to their gradation. In Shah Jahan's court people all over the world came to his courts. Many paintings show presence of European. At the time of Shah Jahan India was the largest exporter of fabric. Europeans also came in search of Spices, gem stones. It took 20,000 people to complete the work. Shah Jahan created an artificial famine since he diverted his funds while creating the Taj. After the death of Mumtaz for 2 years he did not listen to any music and hairs became white overnight. Mumtaz died while delivering her 14th children at the age of 38! Mumtaz Mahal mothered Aurangzeb. According to Ebba Koch architectural historian, an art historian, the complex of Taj Mahal is made like the garden of Paradise, mentioned in Quran. Islamic tradition describes heaven as having eight "doors" or "gates." Inside the chambers of Taj there are 8 chambers. The pietra dura (from Italy) work in Taj Mahal was influenced by Itmad-Ud-Daulah's Tomb. It was also inspired by Sikandra and others. It has taken concepts from various other architectures around that time. Sadly no information is known about the artists. When we finished out tour it was already 8.30 am. Then we had our breakfast and then left for our hotel. We could not have it at famous Joney's place at Taj Ganj. Since it was full. We checked out of our hotel and left for Sikandra which is 10 km from Agra. We left for Bijli ghar (which is like Esplanade of Agra) by atuo (10 minutes – Rs 10) and from Bijli Ghar we went to Bhagwan Talkies by another auto (Rs 15). From Bhagwan talkies most of the autos goes to Sikandra (10 km north of Agra on the Agra Delhi highway).Open from sunrise to sunset. The tomb of Akbar lies here in the centre of the large garden. Akbar started its construction himself but it was completed by his son Jahangir, who significantly modified the original plans which accounts for the somewhat cluttered architectural lines of the tomb. Four red sandstone gates lead to the tomb complex: one Muslim, one Hindu, one Christian, and one are Akbar's patent mixture. There is a nice garden inside where we saw the deers grazing. The mausoleum reminds me of the one in Bukhara, Uzbekistan and Iran. Then we came back by auto and reached Bijli Ghar. At Bijli Ghar we had our lunch at 3 pm. Agra Fort is just beside Bijli Ghar. Then we walked up to the Agra Fort. At Agra Fort on my insistence we opted for Audio guide, which turned out to be verrrrrrry nice. When we finished it is already 5.30 pm and we had to hire an auto for Rs 250 to see the rest before sunset. We crossed the Jamuna (which was full because of recent flood in Uttaranchal) first went to Itmad-Ud-Daulah's Tomb. We almost gate crashed into it. Empress Nur Jahan (wife of Jahangir) built Itmad-Ud-Daulah's Tomb, sometimes called the Baby Taj, for her father, Ghias-ud-Din Beg, the Wazir or Chief Minister of Emperor Jahangir. Small in comparison to many other Mughal-era tombs, it is sometimes described as a jewel box. Its garden layout and use of white marble, pietra dura, inlay designs have many elements of the Taj Mahal. 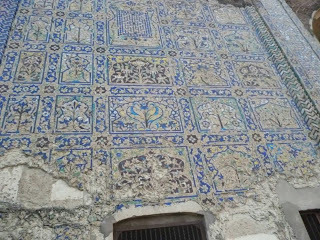 What I found very interesting is it predates Taj. So Taj is not original. Then we went to Chini Ka Rauza. A memorial dedicated to the Prime Minister of Shah Jahan, Allama Afzel Khal Mullah Shukrullah of Shiraz. It is notable for its dome of blue glazed tiles. The mausoleum reminds me exactly of the one in Bukhara, Uzbekistan and Iran. It is in real bad shape. It needs huge restoration work. It is one of its kind in India. I saw people playing cricket, making one of the walls as wicket. It is surprising that it is so near to Taj Mahal, but nothing is done to restore it, while there is so much security around Taj. The we left for Mehtab Bagh. 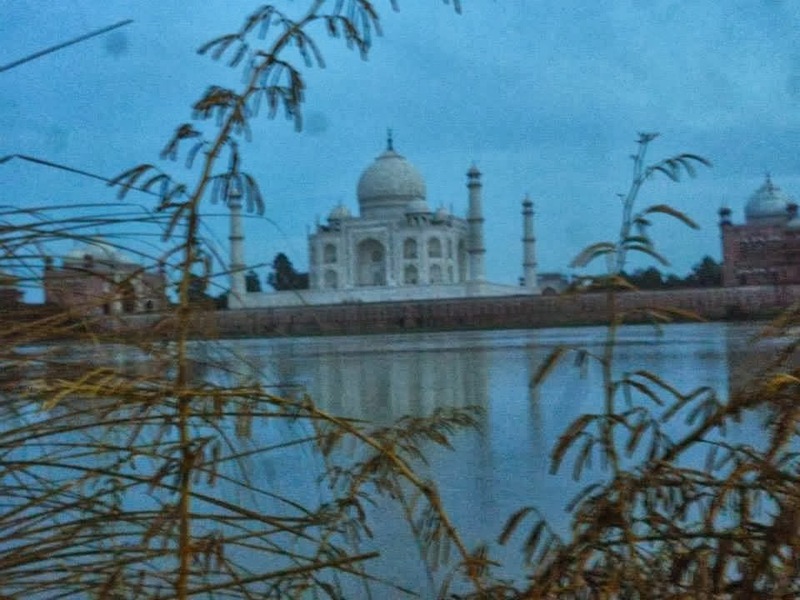 These botanical gardens give you an opportunity to view the Taj from the opposite side. Unfortunately we reached little late. The entrance was just closed. But luckily there is road which leads to Jamuna River from where one can have wonderful view. So in other words there is no need to pay for the entry fee and take this route to see Taj from the other side. We saw some security personnel permanently settled there and as usual they were hyper active when people were trying to take pictures. We stayed there till it is dark. After that we came back to Bijli Ghar by our auto. The roads are quite bad. We were told it was much better during the regime of Mayawati. From Bijli Ghar we went to Taj Ganj area and had our dinner at a leisurely place. Agra specialties are petha, a type of very sweet candy and Dal Moth, a spicy lentil mix. Both are also popular souvenirs. There are quite a few good sweets shops all-round the city. The best stores for buying the famous petha of Agra are at Panchi’s. There are many types of petha available but, for the authentic experience, try either the plain one (ivory white) or Angoori Flavored (rectangular and yellow pieces soaked in sugar syrup). In fact almost all the petha shops are named as Panchi Petha – similar to our very own Dulaler Tal Michri in West Bengal. Mohua bought some Petha as a souvenir. Then we went to our hotel to pick up our luggage and left for station by hiring an auto. Our train was at 11.30 pm. We reached Lucknow at around 6 pm and we went to the AC waiting room at the Lucknow station and also had our breakfast there. Then Mohua left for the airport to catch the plane for her official work at Delhi. I was about to miss the train, since I boarded the wrong train! The name of two trains is almost similar. The train number is almost similar. Amritsar Express! The timing is almost same! Luckily at the nick of time, thanks to Mohua, I got to board the right train.